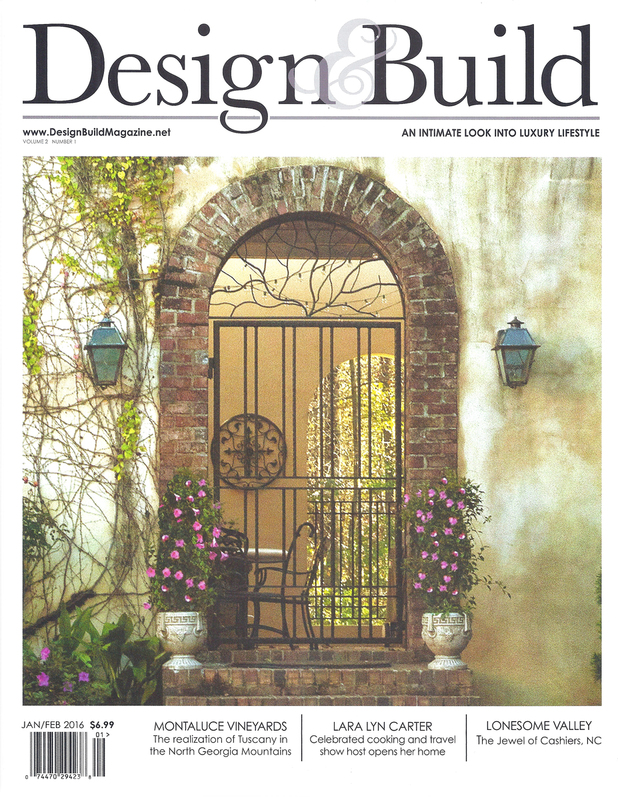 In depth article written by Elizabeth Crotts featured in Design & Build Magazine, Jan/Feb 2016, Vol 2 No 1. Temporary Storage Gallery #104 is pleased to present DromomaniaX2, a two-person exhibition featuring artists Stacey Cushner and Liselott Johnsson. The opening reception, which also includes Domesticated Space Travelers by Galerie Project at Gallery #105, will be held on Friday, November 13 from 6PM to 12AM. Through painting, sculpture and drawing, DromomaniaX2 explores the intimate immensity of the forest and the infinite geometry of wood. Referencing “dromomania”–an uncontrollable urge to wander, the exhibition features new work by Cushner and Johnsson that investigates the importance of forests through a celebration of natural beauty and creative inspiration. Reflecting their duel interest in the texture and material of wood, Cushner and Johnsson articulate forests as poetic spaces that deserve both preservation and contemplation. For both artists, forests are essential not only for their practical use and survival, but also for their influential cultural role in the contemporary world. As philosopher Gaston Bachelard writes, “Immensity is a philosophical category of daydream. Daydream undoubtedly feeds on all kinds of sights, but through a sort of natural inclination, it contemplates grandeur.” Like Bachelard’s statement, numerous artists have depicted the sublime connection between humans and the open landscape of forests. Not only experienced through expanse, inspiration can also be found in the infinitely small and complicated wood grains, the changing growth pattern of a tree and the unique geometry of leaves. Engaging with both the monumental and the miniscule, Cushner and Johnsson’s works portray the increasingly rare interaction between humans and the forest. 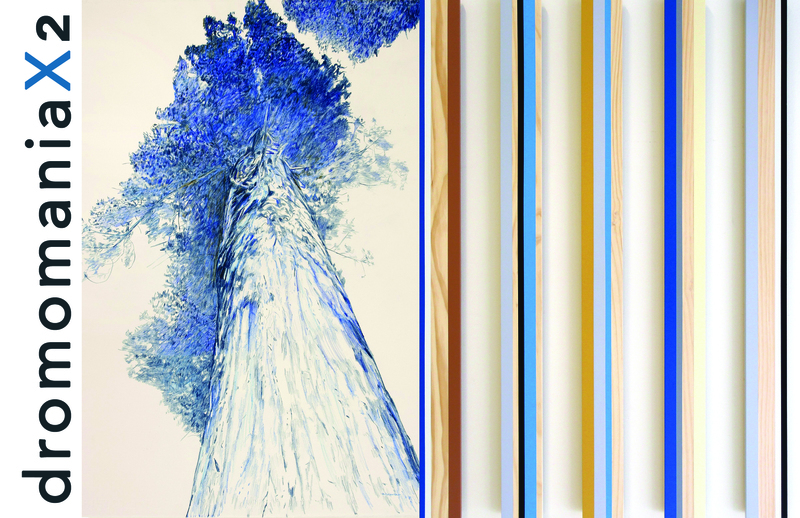 Cushner’s delicate drawings and paintings represent the exquisiteness of wood grain and trees; while Johnsson’s abstract sculptures and paintings focus on the materiality of wood, using harvested pine from Georgia. With their diverse practices, the artists transform the gallery into a mediation on the formal quality of wood, the pine forest’s labyrinth-like space and light and the structure of the complex living systems found in the forest. Stacey Cushner is a Boston-based drawer and painter who studied Fine Art at Brandeis University and received her MFA in Visual Arts at Lesley University’s College of Art and Design. She teaches drawing and painting at the Museum of Fine Arts, Boston. Cushner has shown her work most recently in SCOPE Art Basel, Basel, Switzerland; Art Southampton, Southampton, NY; Art Silicon Valley, San Francisco, CA and the Boston International Fine Art Show, Boston, MA. Her work is included in private collections. She has exhibited her work in solo, two-person and group shows around the world. She has received prizes for her work, including an honorable mention from New York City’s Hollis Taggert Galleries and an honorable mention at the Blanche Ames National Exhibition in Massachusetts. She was the artist-in-residence at The WYE in Berlin, Germany, the OBRAS Foundation in Holland and will be an artist-in-residence at the Red Gate Gallery in Beijing, China in 2016. Her work was featured in The Art Guide, New York. Please see www.staceycushner.com for an extended CV and also her most recent work. Artist and registered architect Liselott Johnsson creates geometric paintings, sculptures and architectural installations that highlight overlooked systems that operate and control our daily life. 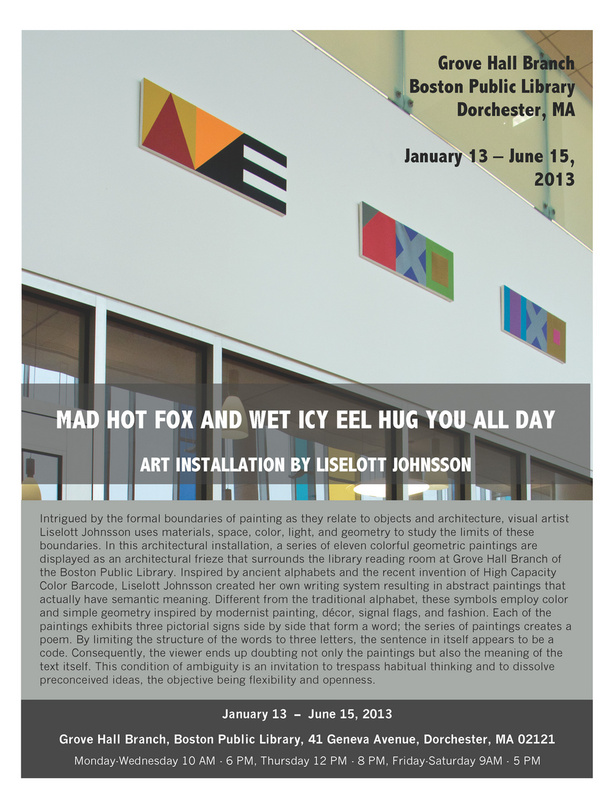 Holding a MFA in Visual Arts from Lesley University College of Art and Design, Johnsson’s work has appeared internationally in both public architectural spaces and art galleries. 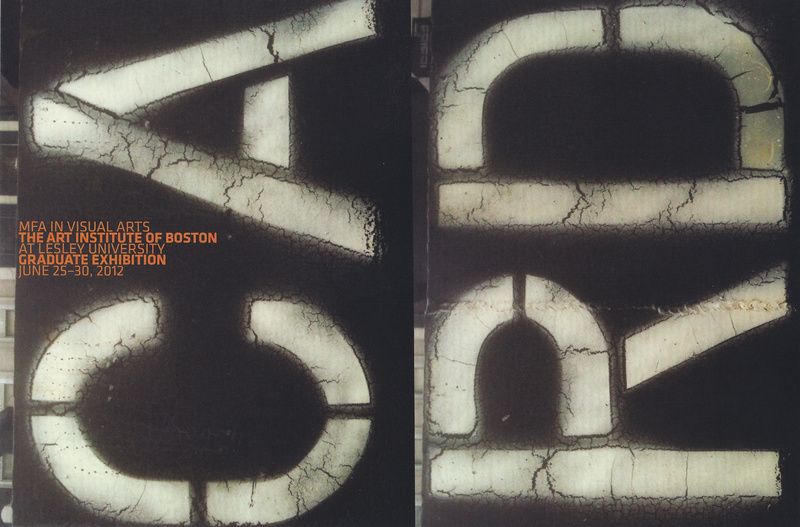 Johnsson has been featured in numerous solo exhibitions, including at the cloister of Monastère de Saorge, Saorge, France; Muhlenberg Public Library NYPL, Chelsea, New York; Glass Cube @ Hotel Indigo, Athens, GA; the historic washing basins of Saorge in the Apes-Maritime, France and Grove Hall, Boston Public Library, Boston, MA. 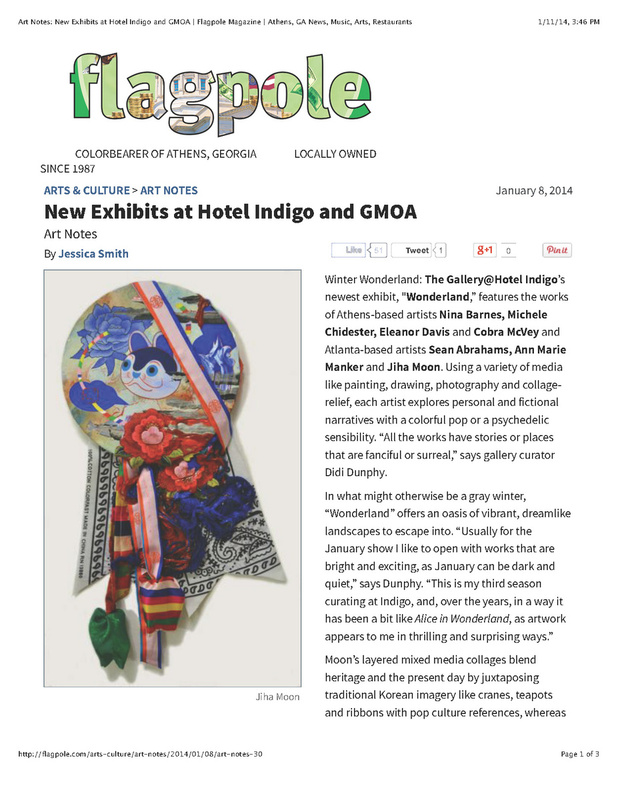 In addition, her work has appeared in group shows in both museums and galleries such as Gertrude Herbert Institute of Art, Augusta, GA–where she won the Jury’s Award; Museum of Contemporary Art of Georgia, Atlanta, GA; Steffen Thomas Museum of Art, Madison, GA; Classic Center, Athens, GA; Lesley University College of Art and Design, Cambridge, MA and Rosenthal Gallery, Fayetteville State University, SC. She also contributed the artwork to the award-winning illustrated novel The Book of I, published in the Fall 2014 by Jaded Ibis Press. An international architect by profession, Johnsson specializes in architectural design, completing projects in France, Sweden, British Virgin Islands and the United States. Her most renowned assignment is Aquamare, a luxury resort in Virgin Gorda, British Virgin Islands, which was featured in Caribbean Hideaways by Meg Nolan van Reesema. Her interest in the relationship between art and architecture has led her to curate numerous contemporary art exhibitions and she held the position of Gallery Director at the Mary S. Byrd Gallery of Art at Georgia Regents University until 2015. Please consult www.liselottjohnsson.com for more information. Sometimes, like the photon that Physics tells us is both wave and particle depending on how it is looked at, it seems to be both; just as often, it seems to be neither one nor the other, nor does it completely seem to be something else. 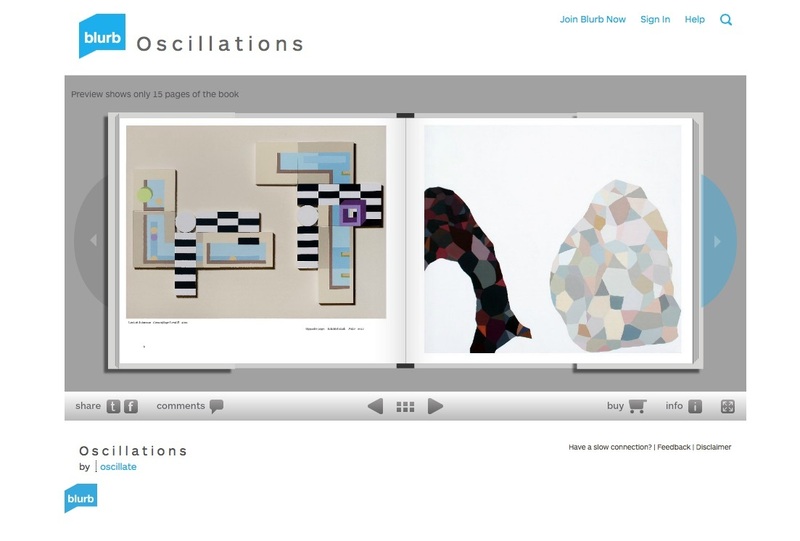 Description: A visual record of the "Oscillations" exhibit at Steffen Thomas Museum of Art in Buckhead, GA. This book catalogs the work of three outstanding emerging artists Liselott Johnsson, Erin McIntosh and Diane Wiencke, as well as gallery views of the exhibition. Included are an introduction by Museum Director Karen Strelecki and an interpretive essay by reknowned art critic Jerry Cullum. Published in Echo, December 19, 2014: Vaishali Jain's Interview "In the Spotlight: Artist and Architect Liselott Johnsson"
Jain, Vaishali. 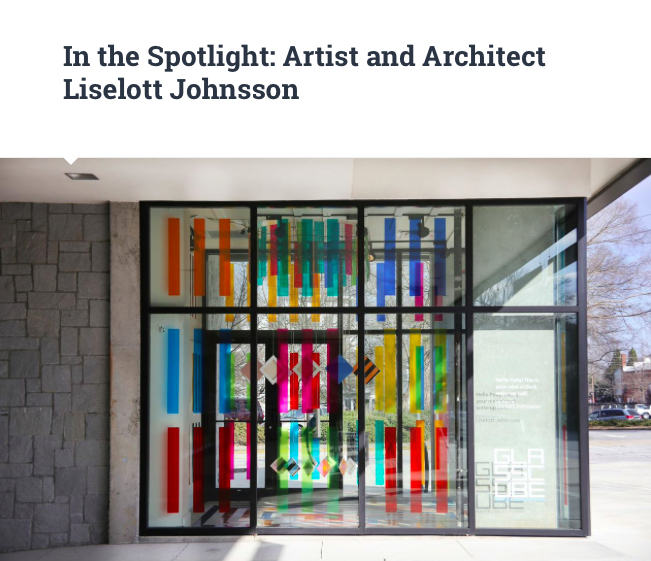 "In the Spotlight: Artist and Architect Liselott Johnsson." Echo-The Pixpa Blog. December 19, 2014. Web. 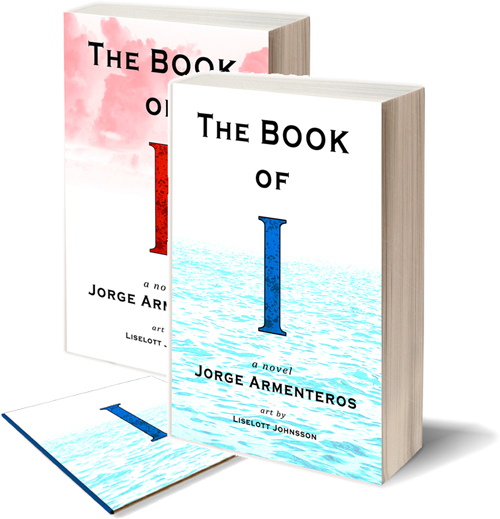 "The Book of I" is the story of Teaston, a painter struggling with schizophrenia who finds himself at the edge of a cliff, at the edge of his life. The book written by Jorge Armenteros includes 24 paintings by artist Liselott Johnsson. In addition, composer and violinist Sarah Wallin Huff created a full album in response to the book. The publisher is Jaded Ibis Press. 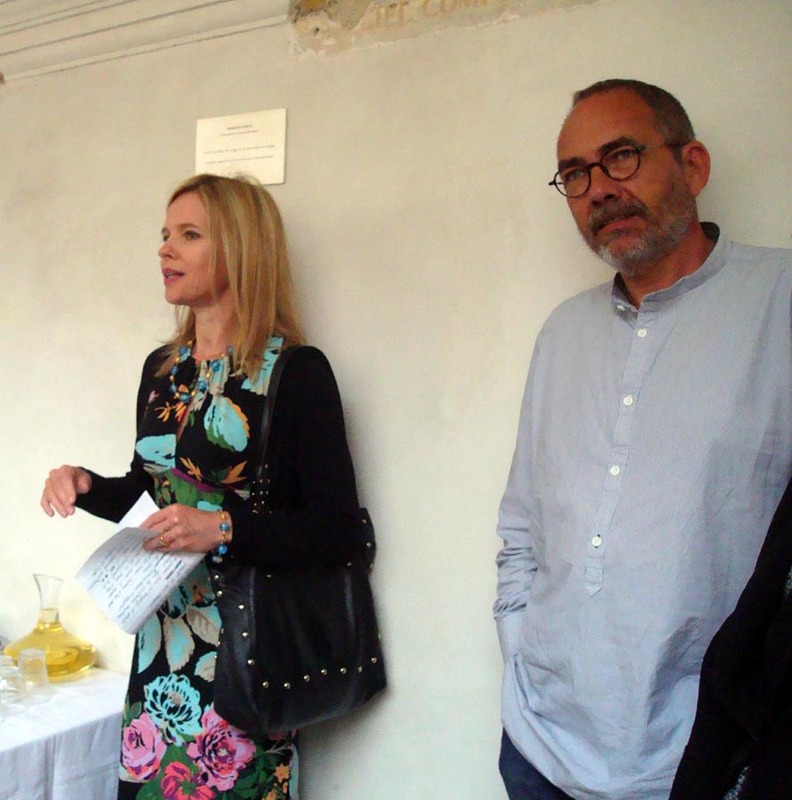 Photos and description from the opening reception of "Plantes Voyageuses" published by Saorge Eternel, a cultural website devoted to the art, culture and history of Saorge, a medieval hill-top village in the South of France. 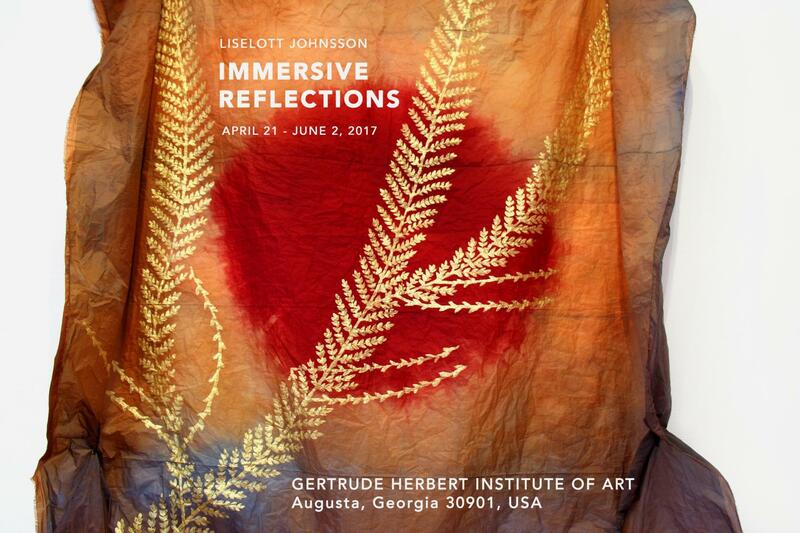 Opening Reception Sunday, June 1 at 6 p.m.
Monastere de Saorge is pleased to present artist Liselott Johnsson?s site-specific installation Plantes Voyageuses, a site-specific installation on view from June 1 to June 28, 2014. An opening reception will be held on Sunday, June 1 at 6 PM. Part of Rendez-vous aux jardins, a national garden celebration that invites visitors to experience the richness of France?s gardens, Plantes Voyageuses transforms the cloisters of the Monast?re de Saorge into an organic and artistic examination of the influential history of the transportation of plants. Johnsson?s installation employs the stunning architecture, beautiful gardens and spectacular mountain setting of the former Franciscan monastery, a national monument of France that currently hosts residencies for writers, to delve into the essential role plant cultivation played in the development of civilization in the Mediterranean basin. Due to the beneficial resources derived from plants?providing food, fuel, materials for goods and healing properties, civilizations as early as ancient Mesopotamia, Egypt and China cultivated gardens and collected plants. For example in Babylon, written records of plants can be dated to the 7th century B.C. with 250 plant-based medicines identified in the cuneiform text during the reign of Ashurbanipal (668-626 BCE). In these societies, the cultivation of plants was considered a spiritual quest, serving as proof of the otherworldly powers of the ruler or the king. In the 16th and 17th centuries, the economic potential of plants grew with the establishment of more sophisticated trade structures, improved navigation skills, better record-keeping practices and increased means of transportation, as well as the creation of Carl Linneaus? universal classification system for plants. Before the construction of the first botanical gardens in Europe and overseas, which was linked to the founding of the first medical universities, plants were predominantly cultivated for ceremonial, culinary and medicinal purposes in monastic gardens like the garden of the Monast?re de Saorge, which was built during the late 17th century. While initially the transportation of plants occurred with dry samples of seeds and seedling since live plants could not survive harsh travel conditions, the Wardian case revolutionized the trade of plants in the 19th century. Named after Dr. Nathaniel Ward, who invented the case to protect his ferns from the sooty polluted atmosphere of industrial Dublin, the sealed Wardian case allowed for the transportation of live plants from one continent to another, increasing the number of recorded and transported species. Drawing on the lengthy history of plant transportation and the unique environment of the Monast?re de Saorge, Plantes Voyageuses features a multi-colored compass rose on the floor of the cloister with baroque garland patterns derived directly from the fruit and flower garlands depicted on the nearby frescoes of the monastery. 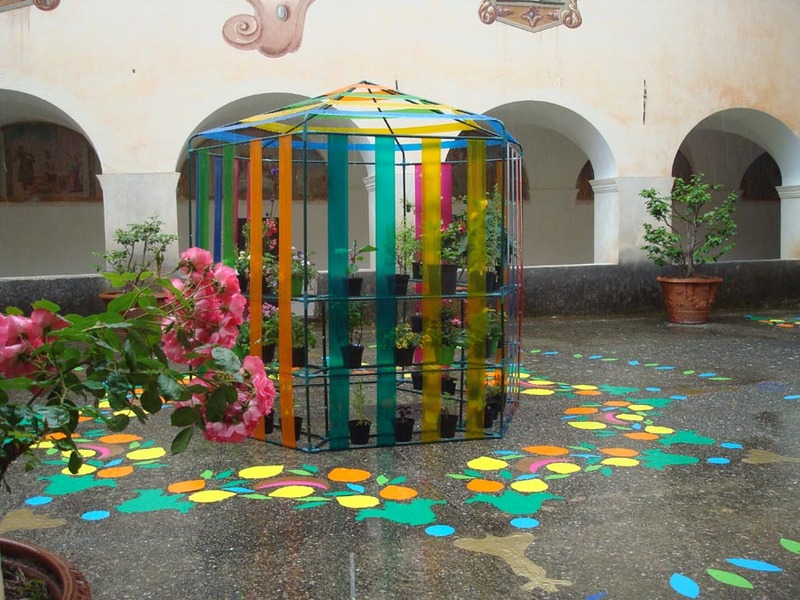 In the center of the cloister, Johnsson deftly displays a large hexagonal plant-filled structure, symbolizing the influence of both the Wardian case and contemporary greenhouses. 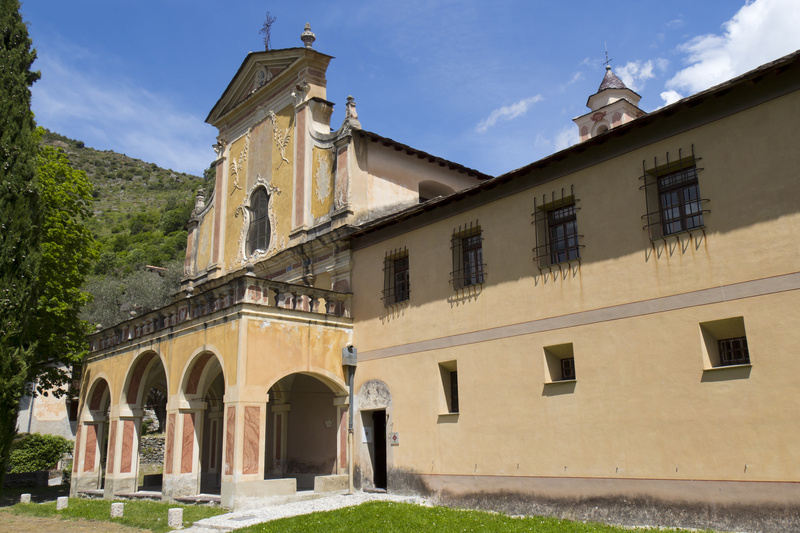 While the plants in the structure at first appear to be typically Mediterranean, Johnsson, in collaboration with the monastery gardener, specifically chose plants that all originated from other parts of the world. After the exhibition, these plants will be part of the permanent plant collection at the monastery gardens. Through Plantes Voyageuses, Johnsson asserts the significance of plant transport as an alternative history?one that reconstructs new interconnected narratives transcending the boundaries of time, geography and culture.? Born in Uddevalla, Sweden, Liselott Johnsson currently lives and works in Madison, Georgia and Miami, Florida. Johnsson has previously shown in Saorge with her recent large-scale outdoor installation La Poetique des Lavoirs at the historic washing fountains. Graduating with her MFA from the Art Institute of Boston of Lesley University, Johnsson has widely shown in both public architectural installation and art galleries such as her recent installation Lifeboat at the New York Public Library?s Muhlenberg Library. Johnsson has also appeared in several group shows in museums and university galleries. An accomplished architect, as well as a fine artist, Johnsson has worked on numerous single-family, multi-family, mixed-use, office and site plan projects in France, Sweden, British Virgin Islands and the United States. Her most renowned project Aquamare, a luxury resort in Virgin Goda, British Virgin Islands, has been featured in numerous publications, including the book Caribbean Hideaways by Meg Nolan Van Reesema. Le Monastère de Saorge a le plaisir de présenter une installation éphémère de l'artiste Liselott Johnsson, créée in-situ et intitulée « Plantes Voyageuses ». L?exposition se tiendra dans le cloître du Monastère du 1er juin au 28 juin 2014. La réception du vernissage aura lieu le dimanche 1er juin à 18 h.
Dans le cadre de Rendez-vous aux jardins,manifestation nationale qui invite les visiteurs à expérimenter la richesse des jardins français, Plantes Voyageuses propose dans le cloître du Monastère de Saorge une exploration naturelle et artistique du transport des plantes et de sa portée historique. L'exposition de Liselott Johnsson s'appuie sur l'architecture remarquable, les jardins en terrasses et le sublime panorama de montagne de l'ancien couvent franciscain, monument national qui héberge aujourd’hui une résidence d’écriture. Elle approfondit le rôle essentiel joué par la culture des plantes dans le développement de la civilisation autour du bassin méditerranéen. Connaissant les innombrables bienfaits des plantes, en matière d'alimentation, de combustible, d'artisanat et de soins, les civilisations anciennes de Mésopotamie, d'Égypte et de Chine cultivaient déjà des jardins et organisaient des collections botaniques. À Babylone, des documents recensant de nombreuses plantes remontent au VIIe siècle av. J.-C., avec 250 médicaments à base de plantes identifiés dans un texte en écritures cunéiformes datant du règne d'Ashurbanipal (668-626 av. J.-C.). Dans ces sociétés, la culture des plantes était considérée comme une quête spirituelle, et témoignait des pouvoirs surnaturels du souverain ou du roi. Aux XVIe et XVIIe siècles, le potentiel économique des plantes prit de l'ampleur avec le développement de structures commerciales plus élaborées, l'amélioration des compétences de navigation, les meilleures pratiques d'archivage et l'essor de nouveaux moyens de transport, ainsi que la création du système de classification universelle de Carl Linneaus pour les plantes. Avant l'ouverture des premiers jardins botaniques en Europe et à l'étranger, liés à la fondation des premières universités de médecine, les plantes étaient principalement cultivées à des fins rituelles, culinaires et médicales, dans des jardins monastiques tels que celui du Monastère de Saorge, établi au cours du XVIIe siècle. Si à l'origine le transport des plantes se résumait à des échantillons de graines et de germes séchés, car les plantes ne pouvaient survivre aux rudes conditions de transport, la caisse de Ward révolutionna le commerce des plantes au XIXe siècle. Ainsi nommée d'après le docteur Nathaniel Ward, qui inventa une boîte capable de protéger ses pousses de l'atmosphère lourde et polluée du Dublin industriel, la caisse de Ward scellée permettait le transport de plantes vivantes d'un continent à un autre, augmentant ainsi le nombre d'espèces enregistrées et transportées. 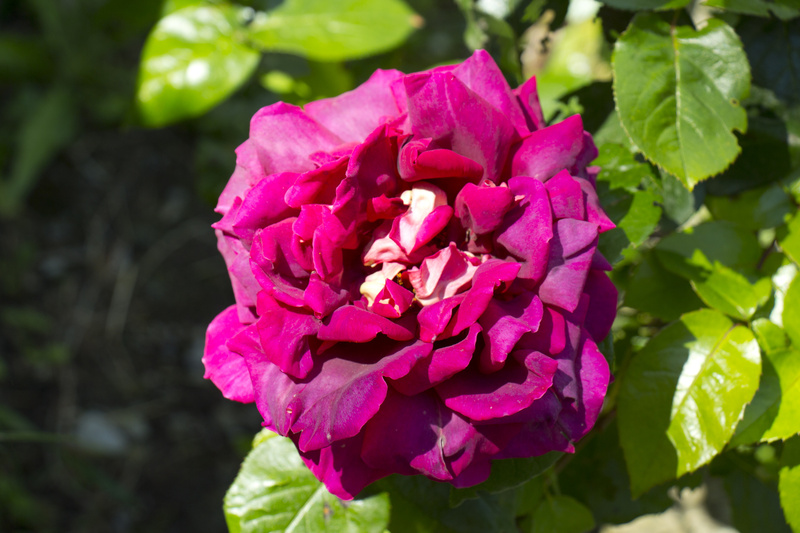 Inspiré par la longue histoire du transport des plantes et par l'environnement unique du Monastère de Saorge, Plantes Voyageuses présente une rose des vents multicolore sur le sol du cloître, avec des motifs baroques issus directement des guirlandes de fruits et de fleurs dépeintes sur les fresques du monastère. Au milieu du cloître, Liselott Johnsson met habilement en scène une grande structure hexagonale remplie de plantes, symbolisant l'influence de la caisse de Ward et des serres contemporaines. Bien que les plantes de la structure paraissent au premier abord typiquement méditerranéennes, Liselott Johnsson, en collaboration avec le jardinier du monastère, a spécifiquement choisi des plantes originaires de diverses parties du monde. Après l'exposition, ces plantes intégreront les collections botaniques permanentes des jardins du monastère. À travers Plantes Voyageuses, Liselott Johnsson affirme l'importance du transport des plantes comme une histoire alternative, qui reconstruit de nouveaux récits interconnectés transcendant les frontières du temps, de la géographie et de la culture. Née à Uddevalla, en Suède, Liselott Johnsson vit et travaille actuellement à Madison, en Géorgie, et à Miami, en Floride. Elle a déjà exposé au sein du village de Saorge, présentant en extérieur une installation à grande échelle, La Poétique des Lavoirs, mise en place autour des lavoirs historiques. Diplômée du MFA à l'Institut des Arts de Boston, Université Lesley, Liselott Johnsson a souvent exposé dans des établissements publics ou des galeries d'art, comme en atteste sa récente exposition Lifeboat à la Bibliothèque publique Muhlenberg de la ville de New York. Liselott Johnsson figure également à l'affiche de différentes expositions dans des musées et galeries universitaires. Architecte accomplie et artiste de talent, Liselott Johnsson a travaillé sur de nombreux projets de construction de maisons individuelles, villas, bâtiments polyvalents et bureaux en France, en Suède, aux Îles Vierges Britanniques et aux États-Unis. Son projet le plus célèbre, Aquamare, station de luxe à Virgin Gorda, Îles Vierges Britanniques, figure dans de nombreuses publications, dont le livre Caribbean Hideaways de Meg Nolan Van Reesema. Upcoming Exhibition: Art installation "Plantes Voyageuses", Monastère de Saorge, France - Sunday, June 1 at 6 p.m. 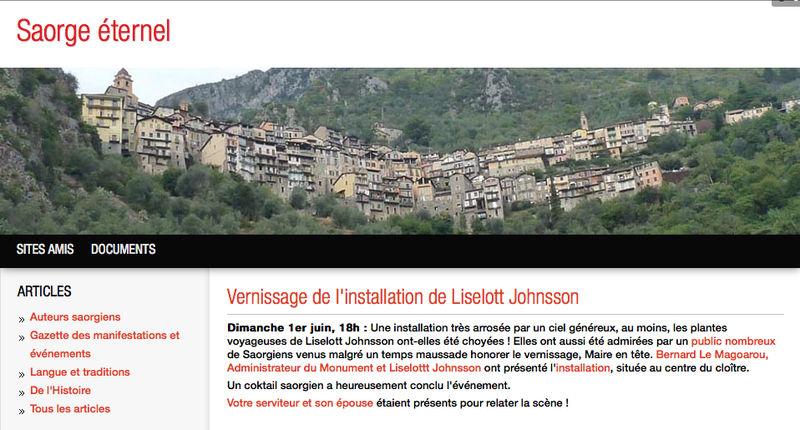 Announcement: The art installation "Plantes Voyageuses" by Liselott Johnsson will open at the 17th century Monastery of Saorge in the South of France on Sunday June 1 at 6 p.m. 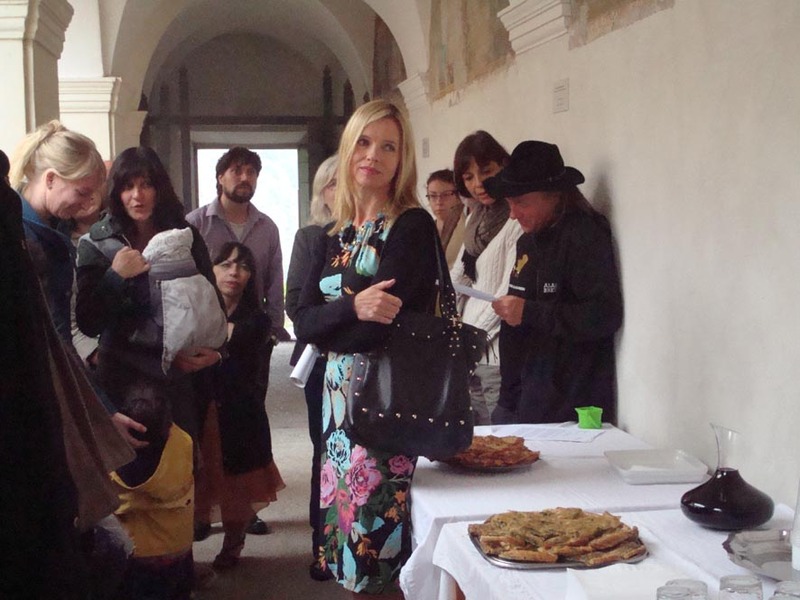 The exhibition, held in the monastery courtyard, is part of the regional celebration "Rendez-vous aux jardins." Monastery of Saorge, a former Fransiscan monastery and a national historic monument of France, currently hosts residencies for writers and is open to the public. 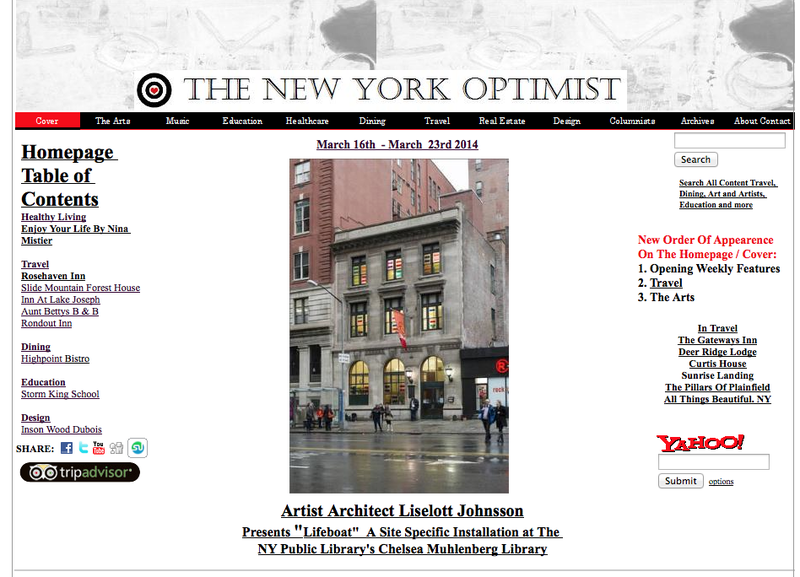 Published in The New York Optimist, March 16, 2014: "Liselott Johnsson Presents Lifeboat, a Site Specific Installation at the NY Public Library's Chelsea Muhlenberg Library"
Published Book: Johnsson, Liselott. 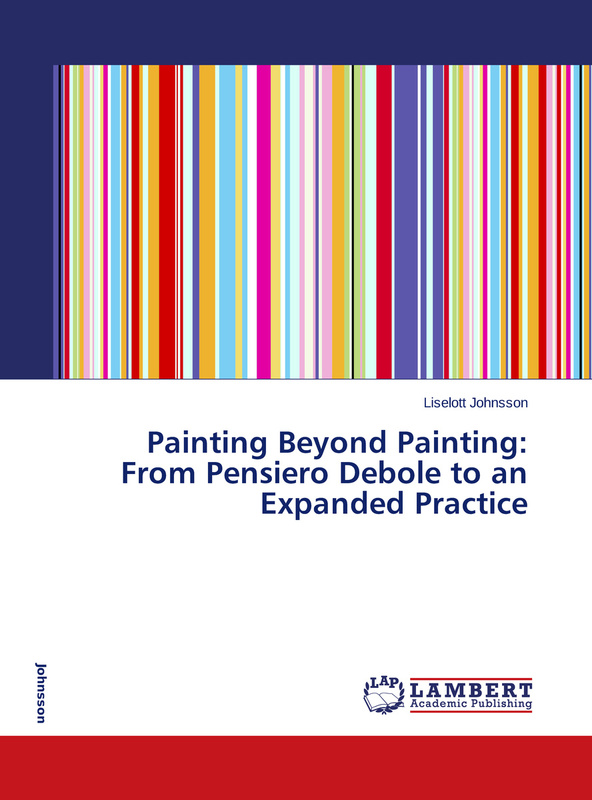 "Painting Beyond Painting: From Pensiero Debole to an Expanded Practice", Saarbrucken: LAP Lambert Academic Publishing, 2014. Print. Intrigued by the formal boundaries of painting as they relate to objects and architecture, I explored materials, space, color, and geometry to study the limits of their relationship. Throughout my master of visual arts program at the Art Institute of Boston, I was inspired by Gianni Vattimo’s theory of “weak thought”—pensiero debole—to allow myself to dismantle, shift, transgress, and corrupt boundaries adopted in my practice as painter, designer, and architect. For every new painting project, I would start with a new premise. In a process characterized by a continuous destabilizing shift, I changed creative approaches, painting methods, materials, and compositions, resulting in a diverse body of work. 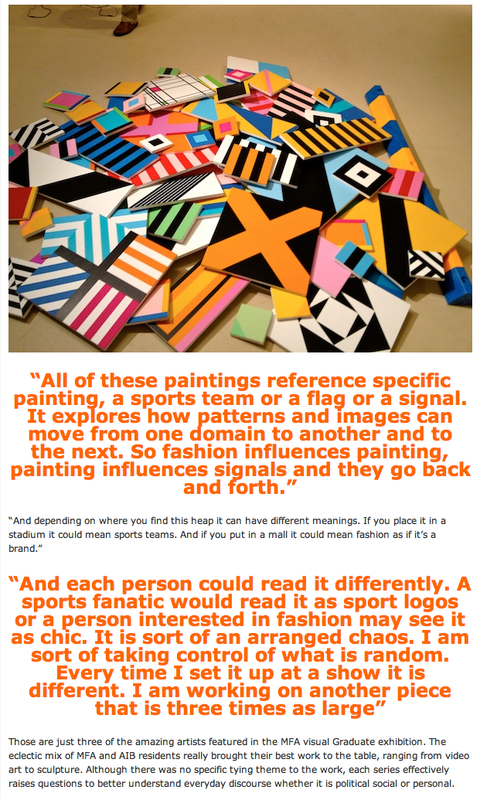 In this thesis, I chose to focus on color, geometry, and the expanded field of painting. From my studies of Baudrillard, Gillick, Grosse, Halley, Judd, Palermo, Vattimo and others, as well as from visual studies of my surroundings and my work in the studio, I deduced that painting does not have any boundaries and that it could comprise two-dimensional surfaces, objects, and architecture, as well as a political message. By allowing the boundaries of my painting practice to open up, I obtained a new understanding of my art. As a result, my painting practice has become the generator for my work as an artist, designer, and architect. Pensiero debole and my MFA program have allowed my art to expand and transform, so that I now understand there are no set boundaries for what a painting practice can encompass or what it can allow an artist to create. Liselott Johnsson is pleased to present Lifeboat, a site-specific installation in the New York Public Library’s Muhlenberg Library, on view until April 3, 2014. A closing reception will be held on April 3 from 6:30 to 8 PM. 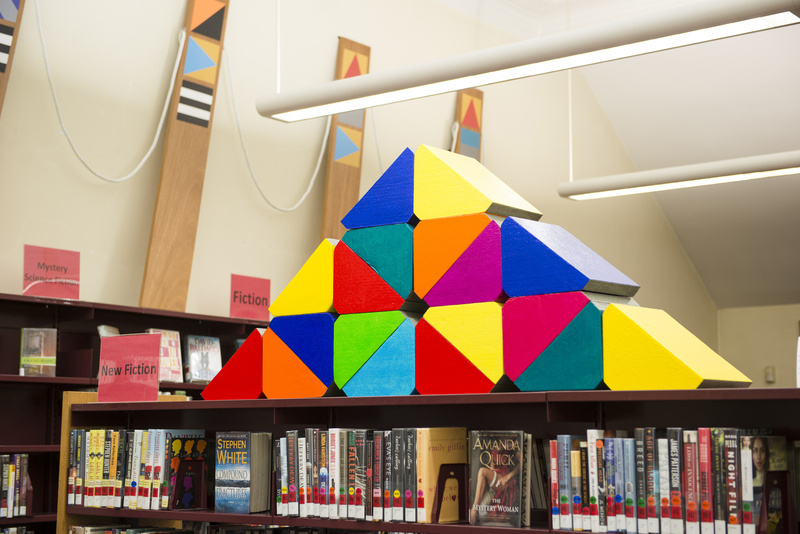 Transforming Chelsea’s Muhlenberg Library into an evocative site of pictorial and linguistic play, artist and architect Liselott Johnsson’s Lifeboat features a variety of brightly colored paintings, sculptures and façade installations, revitalizing the way viewers approach the visual language of hard-edged abstraction. 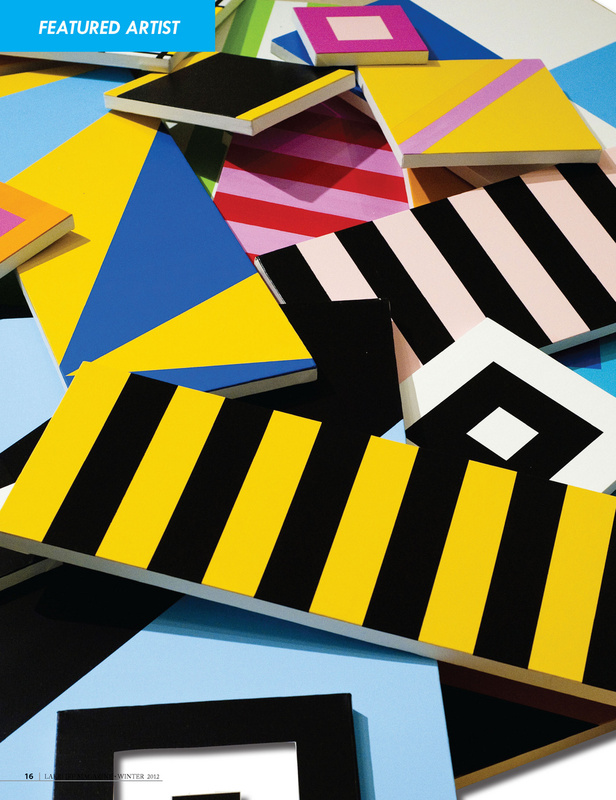 While, at first glance, Johnsson’s vibrant and striking patterns appear to conform to the overexposed modernist tradition, Johnsson’s paintings come alive when decoded through her own invented visual alphabet, entitled High Modernist Color Barcode, which links each of her geometric patterns to a singular letter. Inspired by the visual vocabulary of marine signal systems and emergency safety objects, as well as modernism and Microsoft’s recently developed High Capacity Color Barcode, Johnsson’s Lifeboat explores the notion that color and pattern can become a code or linguistic system, highlighting the often overlooked visual systems that dominate our daily lives. Creating a new form of reading on the walls of the Muhlenberg Library rather than in its collection of books, Lifeboat, once deciphered, turns the quiet environment of the library into a verbal and visual creative world where hidden and, at times, foreboding meanings can be articulated. Titled for her conception of a lifeboat as an “in between” space–at once safely rescued and fearful of the future, as well as an absurd Monty Python sketch, Lifeboat rescues the hackneyed language of high modernist abstraction, opening up new spaces of meaning and uses. Inviting a unique and inspiring relationship between the installation and its viewers, Lifeboat calls attention to what art and, consequently, the architecture of the library are saying to us. Born in Uddevalla, Sweden, Liselott Johnsson currently lives and works in Madison, Georgia and Miami, Florida. 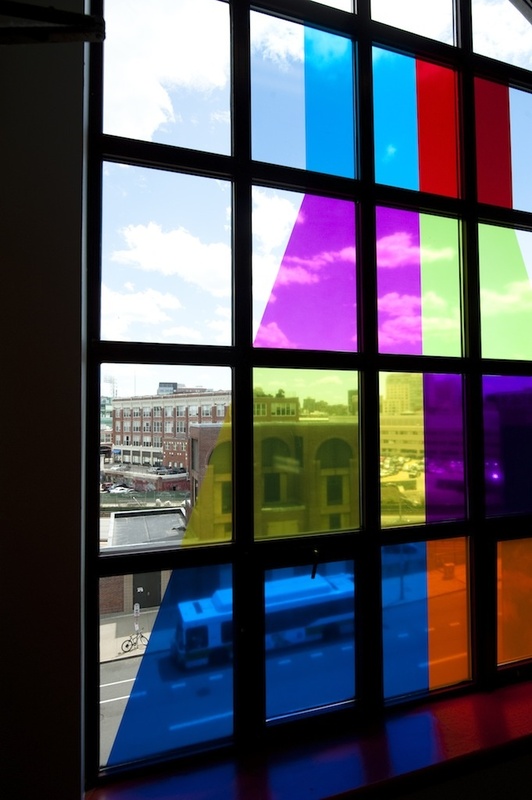 Since graduating with her MFA from the Art Institute of Boston of Lesley University, Johnsson has widely shown in both public architectural installations and art galleries such as her current installation Hello Polly! This Is Your 9 O’clock Wake-Up Call at the Glass Cube in Hotel Indigo in Athens, Georgia and her recent large-scale outdoor installation La Poetique des Lavoirs at the historic washing fountains of the alpine village of Saorge in the Alpes-Maritimes, France. In addition to her solo exhibitions and installations, Johnsson has also appeared in several group shows in museums and university galleries. An accomplished architect, as well as a fine artist, Johnsson has worked on numerous single-family, multi-family, mixed-use, office and site plan projects in France, Sweden, British Virgin Islands and the United States. Her most renowned project Aquamare, a luxury resort in Virgin Gorda, British Virgin Islands, has been featured in numerous publications, including the book Caribbean Hideaways by Meg Nolan Van Reesema. 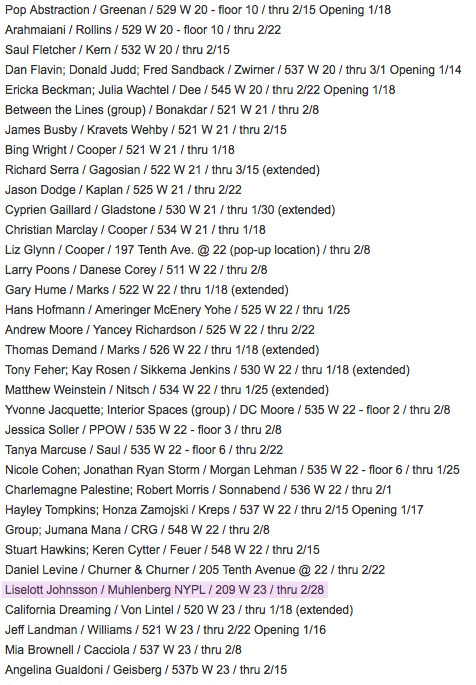 Featured on Andrew Ginzel's List of selected shows to see in New York, Two Coats of Paint, January 14, 2014. Chelsea show is featured up on Andrew Ginzel's List of selected shows to see in NY! 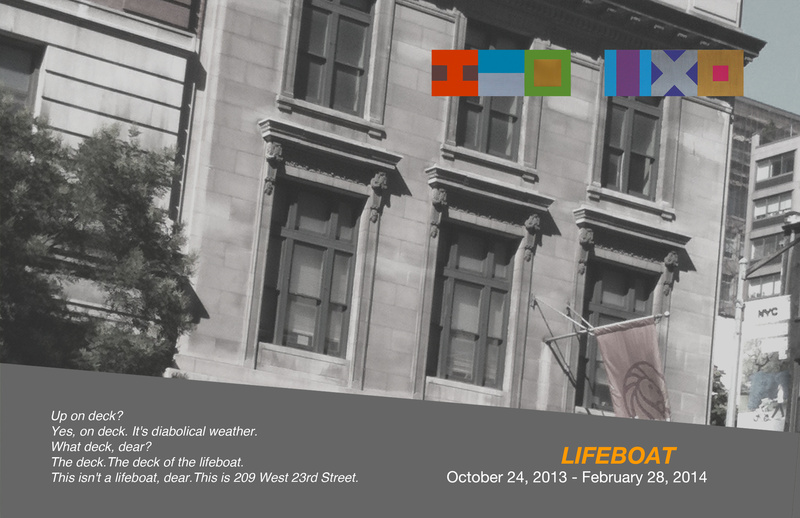 Exhibition LIFEBOAT is up until April 3 at Muhlenberg Library NYPL, 209 West 23rd Street, New York, NY 10011. Dimanche 1er juin, 18h : Une installation très arrosée par un ciel généreux, au moins, les plantes voyageuses de Liselott Johnsson ont-elles été choyées ! Elles ont aussi été admirées par un public nombreux de Saorgiens venus malgré un temps maussade honorer le vernissage, Maire en tête. Bernard Le Magoarou, Administrateur du Monument et Liselottt Johnsson ont présenté l'installation, située au centre du cloître. Un coktail saorgien a heureusement conclu l'événement. Votre serviteur et son épouse étaient présents pour relater la scène ! WONDERLAND & HELLO POLLY, THIS IS YOUR 9 O'CLOCK WAKE-UP CALL! Wonderland, the group exhibition in the Gallery features seven artists all investigating personal and fictional narrative with a pop or psychedelic sensibility. A variety of mediums, from photography and collage to painting and drawing, works by Athens based artists Michele Chidester, Eleanor Davis, Cobra McVey, Nina Barnes and Atlanta based artists Sean Abrahams, Jiha Moon and Ann Marie Manker, will be on exhibit.Â Sean Abrahams indicate â€œDr. Seussâ€ landscapes, Jiha Moonâ€™s reliefs collapsing American Disney images with Korean culture and Cobra McVeyâ€™s photo collages of trailer interiors glimpsing out to a Star Trek like landscape will all be fanciful and colorful for a January show.Â Eleanor Davisâ€™s â€œstory-bookâ€ narrative paintings and Michele Chidsterâ€™s surreal gouaches, Ann Marie Mankerâ€™s rainbow femme fatale portraits and Nina Barnes collages will also be on view. 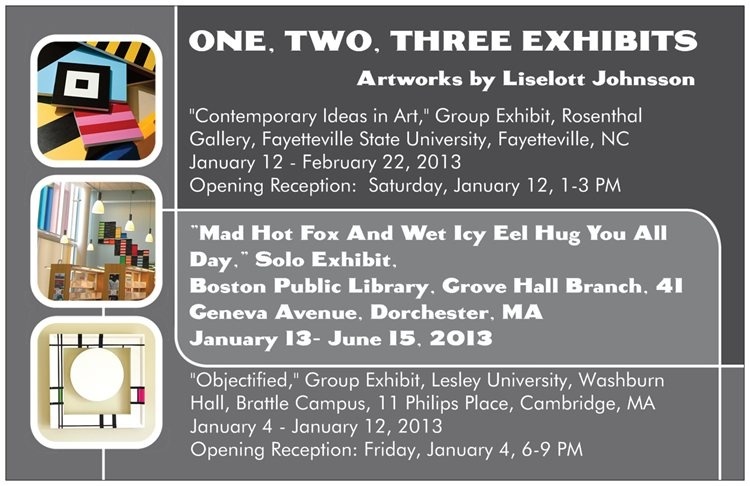 On view in the GlassCube, is a new installation by Madison-based artist Liselott Johnsson, Hello Polly! This is your nine oâ€™clock wake up call! This is a sculptural work using hard edge geometry and color field painting combined with the inspiration of Monty Pythonâ€™s whimsy.Â A chandelier whose ornaments are small paintings and whose centerpiece is a large blue parrot is installed within an environment of pattered color vinyl in which the sunlight or streetlight reflects.Â Liselott Johnsson was born in Sweden, is a trained Architect from Columbia University and has a MFA from Art Institute in Boston. 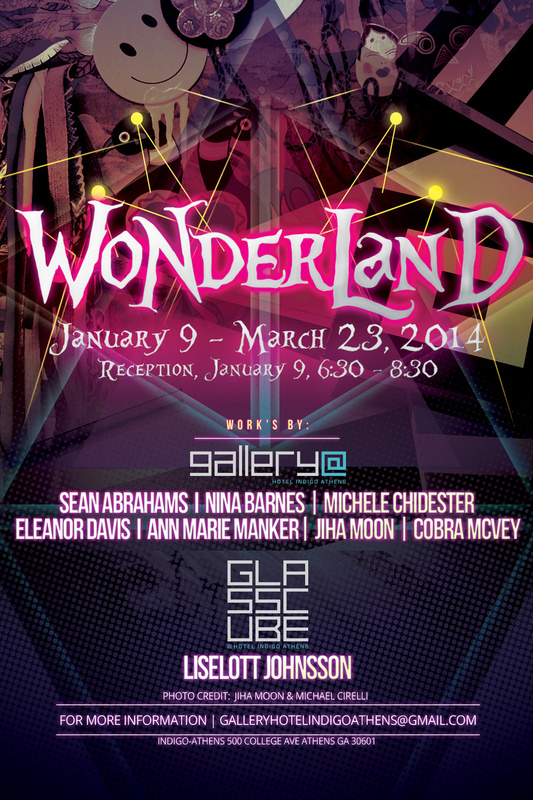 on Thursday, January 9, 2014 from 6:30 â€“ 8:30 pm.Â The opening reception will feature hors dâ€™oeuvres, selections from the bar and an opportunity to meet fellow Athensâ€™ art enthusiasts. 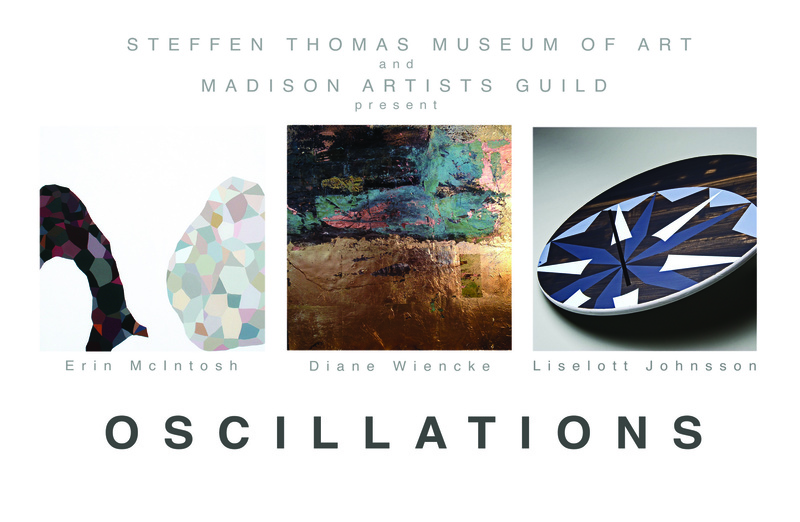 Reception: Thursday, October 24, 6-8 p.m. In "Lifeboat," visual artist and architect Liselott Johnsson, introduces the visual vocabulary of marine signal systems and emergency safety objects into the placid environment of the library. Inspired by naval flags, ancient alphabets, modernist painting and the recent Microsoft invention of High Capacity Color Barcode, Johnsson creates her own writing system resulting in objects and paintings that acquire semantic meaning. ATHENS, Ga. â€“ The Classic Center is pleased to announce the opening of two new public art exhibits featuring the works of 14 regional artists that will be on display beginning Sept. 15.
â€œItâ€™s Like A Rainbowâ€ features large scale abstract paintings, both lyrical and minimal, conceptual and expressionistic, but all full of joyful and riotous color. â€œAssembleâ€ is a group of smaller works using the technique of collage, actual cut and paste or digital compositions. Materials range from re-purposed junk catalogues to elegant fine art paper. 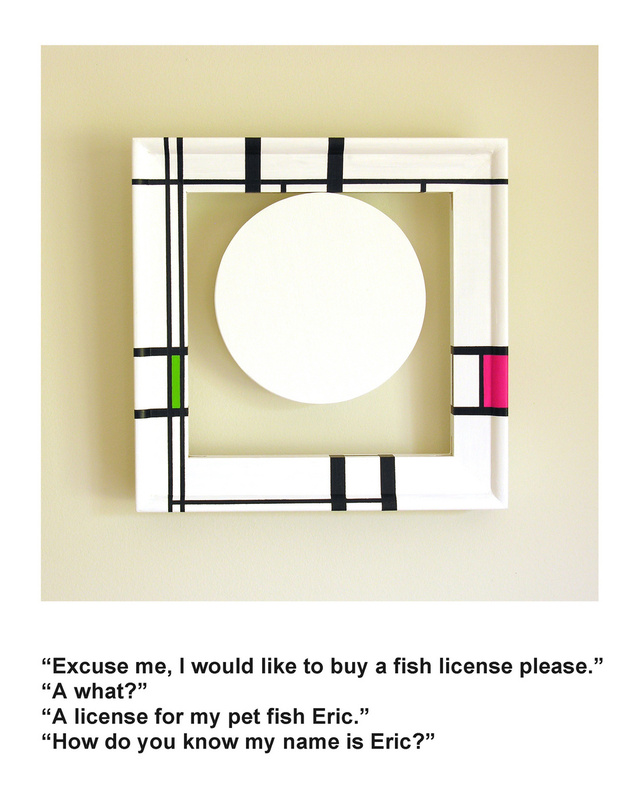 Gallery III will be exhibiting selected works by Athens artist Kathryn Refiâ€™s â€œColor Recordingâ€ series. Refiâ€™s elegant stripe paintings are records of colors in her surroundings she saw and recorded on a given day. Both exhibits will be up through Jan. 31, 2014, and are located in The Classic Centerâ€™s new exhibit space â€“ Classic Art Galleries I, II and III â€“ that opened in February under the direction of the Classic Center Cultural Foundation. One of the missions of the Foundation is to broaden the exposure of the arts to people in the Athens community. For information regarding the exhibits and artworks, e-mail Didi Dunphy. For more information on The Classic Center Cultural Foundation, click here. Johnsson, McIntosh and Wiencke. Three accomplished painters, three distinct contemporary expressions of abstraction in art. These artists use materials, process, geometry and color to investigate the meaning of abstract art and thinking today. The result is a thought-provocative, engaging and relevant exhibit that conveys an emotion of the oscillating nature of contemporary culture and aesthetics. Published in Nice-Matin on Monday May 27, 2013: Article by Daniel Staub "Les lavoirs...la vie"
Staub, Daniel. "Les lavoirs...la vie." Nice Matin. May 27, 2013. In the springâ€”the season when melting snow fills creeks, sources, and fountainsâ€”the mountainside village of Saorge in the French Maritime Alps will host an art exhibit by Liselott Johnsson called â€œLa Poetique des Lavoirsâ€ in its three historic washbasins: Fontana de MÃ¨dge (1871), Fontana da Caranca (1898), and Fontana Soutana (year unknown). The community is invited to attend the opening on Friday, May 24 at 11.30 AM at Fontana de MÃ¨dge hosted by the Mairie de Saorge.Â The installation will be on view from Thursday, May 23 until Wednesday May 29. The flowing water, the beating of the laundry, high volume conversation, and adjacent sounds of children playing filled the lavoir areas with activity. Author Mireille Roddier describes the lavoir as â€œa dynamic social space that mirrored the perfidious complexities of life, accentuating the contrast with todayâ€™s empty, silent space that only reflects inverted images in the waterâ€™s too stagnant surface.â€ The lavoir represented a uniquely feminine space and in a sense served the same function as the village cafÃ© frequented by men. The main difference was that the women had to work while socializing. Today, the lavoirs are rarely used for their intended purpose, but water still flows through them as persistently as in years past.Â According to philosopher Gaston Bachelard, water is a poetic material. The attraction and mesmerizing effects that water has on the creative human mind cannot be disputed. Waterâ€™s symbolic qualities are often given prominence in the arts. In literature, they are embodied by the death of Ophelia; in myth, they are represented by the self-admiring Narcissus; and in painting, they are depicted in Sandro Botticelliâ€™s, The Birth of Venus, where they signify the very essence of life, birth, and vitality. In contemporary everyday life, water is conveniently delivered and disposed of in conduits, hidden away from sight and touch, allowing for little poetic contemplation.Â The village of Saorge is one of the few places where the sound of flowing water is continuously present. Its monuments tell the story of a heroic past, while its fountains represent the poetry of the everyday.Â The movement and rhythm of water and its different transformative stages seem to depict the flow and substance of life, a theme that will always be relevant. 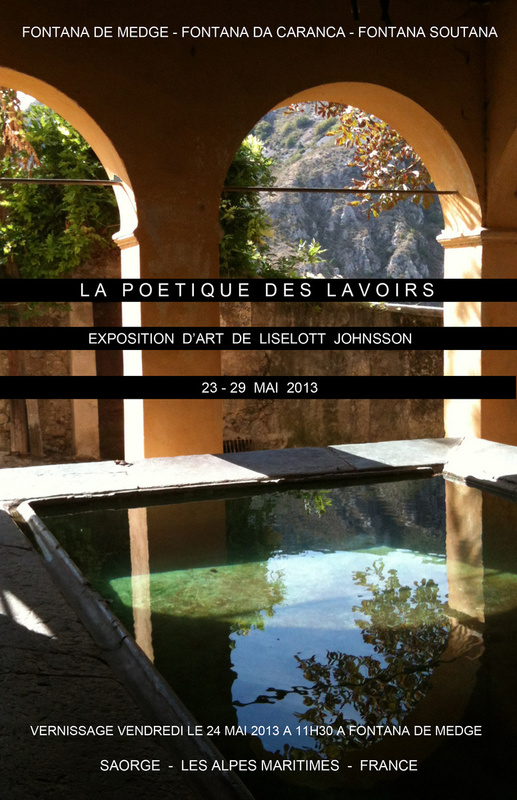 The community is invited to attend the opening of Johnssonâ€™s â€œLa Poetique des Lavoirsâ€ on Friday, May 24 at 11.30 AM, hosted by the Mairie de Saorge at Fontana de MÃ¨dge, Saorge 06540, France.Â The installation will be on view from Thursday, May 23 until Wednesday, May 29. What are the current trends of fine art visual producers today? Â Contemporary Ideas in Art, January 12 â€“ February 22, 2013, is an invitational exhibition of contemporary thoughts on art making from national and international artists that will examine the current trends for making art in the new millennium. The works selected from emerging and established artists in a wide range of visual practices. All approaches to visual art making will be considered in valid fields of exploration by the selection committee. This will undoubtedly create a very exciting and thought provoking experience for gallery visitors. A play of power -- to Objectify. Through careful execution, context, and perspective, the artist alters the subject beyond the boundaries of its initial intent. But there is always a choice: to draw power from a subject, demoting it to the level of mere object lacking significance and autonomy, or to imbue the commonplace object with purpose and meaning not inherent in its original form. With every gesture, in every process, with every decision to Objectify, the artist sets the boundaries of power and invites the viewer to be a witness to the transformation. Published in Lakelife Winter 2012: Kim Jackson's interview "The Art of Liselott Johnsson...More Than Meets The Eye." Jackson, Kim. "The Art of Liselott Johnsson...More Than Meets The Eye." Lakelife. Winter 2012. 16-18. An Art Exhibition informed and inspired by books and works of literature by Â the Â Art Institute of Bostonâ€™s MFA Graduates June 2012. 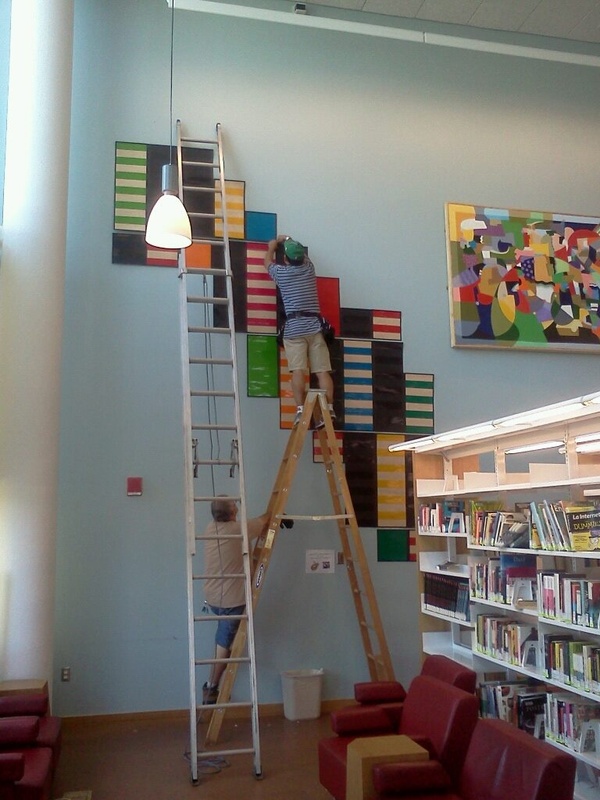 Â Location: Grove Hall Branch of the Boston Public Library, 41 Geneva Street, Dorchester, MA 02121. Exhibition Dates: Â August 18 â€“ October 28, 2012, Monday â€“ Wednesday 10 AM â€“ 6 PM, Thursday 12 PM â€“ 8 PM, Friday 9 AM â€“ 5 PM. The MFA Graduate Exhibition at The Art Institute of Boston at Lesley University, took place on June 25-30, 2011 at 700 Beacon Street, Boston, MA. The artists included were Robert Bern, Jill Brody, Jeff Brown, JooYoung Choi, Micahel Cirelli, James Cox, Rebecca Colon Dickerson, Steve Gentile, Liselott Johnsson, Shea Justice, Betti Pettinati-Longinotti, Francesca Milliken, Aris Moore, Peter Murphey, Dana Pasila, Dwight Smith, Diane Wiencke, and Joseph Wilcox. UNFOLDING THE BOOK. August 18 - October 28, 2012. Group Exhibit featuring artists Dana Pasila, Betti Pettinati-Longinotti,Â Liselott Johnsson, Aris Moore, Michael Cirelli, Dwight Smith, Diane Wiencke, Becky Colon Dickerson, Jill Brody,Â Â Jeff Brown, Joseph Wilcox, Shea Justice Sr., Robert Bern at Grove Hall Library, 41 Geneva Avenue, Dorchester, MA 02121. OFF THE WALL: GRADUATE EXHIBIT @AIB MFA GALLERY. 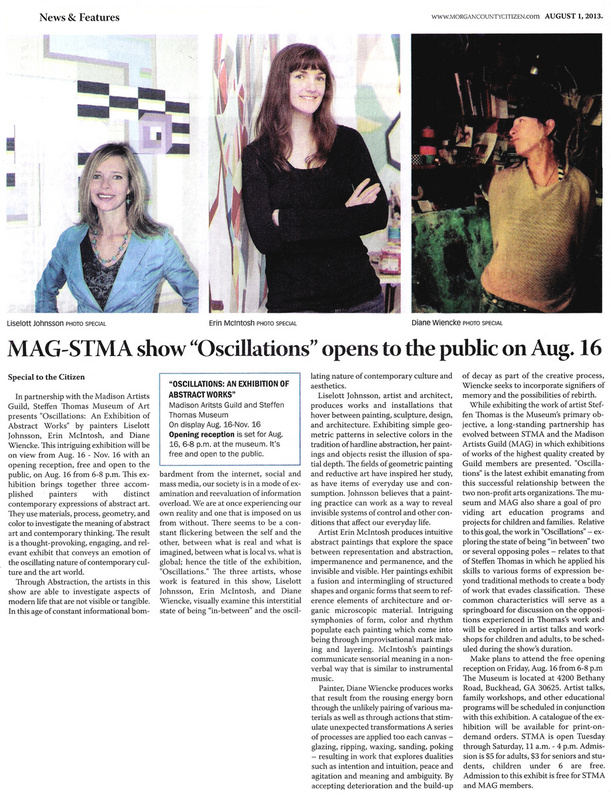 A review of the graduate exhibit written by journalist Christina Lacoste posted July 9, 2012 on www.digboston.com. 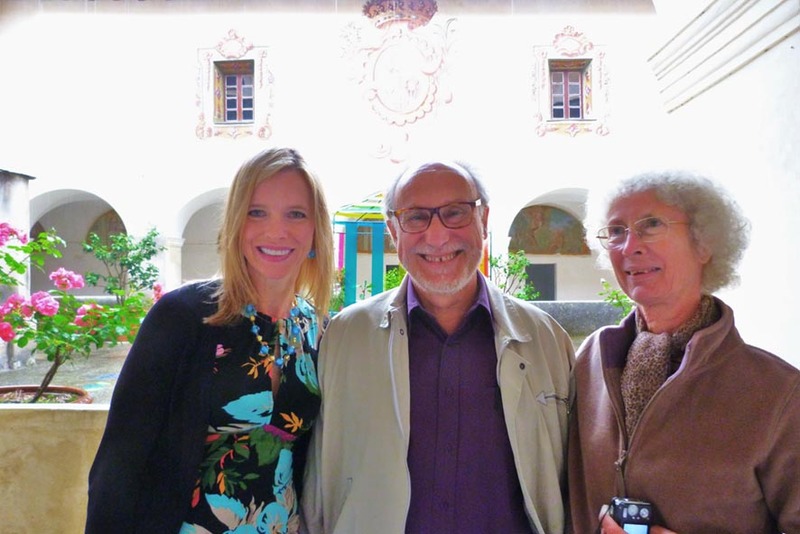 Artists reviewed were Jill Brody, Jeff Brown and Liselott Johnsson. The installation TRAPPA has become a permanent installation at the Art Institute of Boston, main staircase from the ground floor to the fourth floor, including stair risers, stair sculptures, and window installations. This installation addresses the geometry of the stair to reveal the deep cultural meanings conveyed by the architecture inherent in a staircase. Besides being an integral part of human civilization since its emergence, the staircase carries deep symbolic and psychological meanings, which are masked under its sober and standardized design. The form and motif of this installation highlights the diagonal movement of the staircase and its ability to function as a connector. The color palette is dynamic, indicating rhythm and body movement, but also referencing the high-intensity colors used in warning signs and exit lighting.